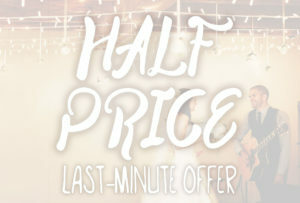 May 2017: Half price last-minute offer! Big news for anyone looking to add the final special touch to their big day! I have a few dates left in May available, and I’m offering these out on a first come, first served basis with 50% off. This would mean the Wedding Ceremony & Drinks Reception music package would be just £225 + travel, or the Drinks Reception only package would be just £185 + travel. Friday/Saturday dates available are May 5th, 6th, 12th, 13th, 19th and 26th. Weekdays and Sundays are also available, except the 14th and 28th. Get in touch here if you’d like any further information or are interested in booking. This entry was posted in News and tagged discount, music, offer, wedding, wedding music, weddings by Pat McIntyre. Bookmark the permalink.